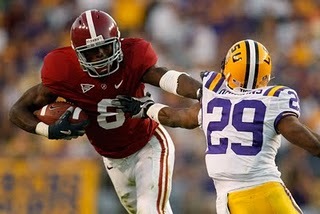 Here in Bama we’re gearing up for the game of the year.. the undefeated Crimson Tide plays the undefeated LSU Tigers this Saturday night in Tuscaloosa. This is the game that should decide who plays for the National Championship, so I’m going all out and making a championship recipe for tailgating on the quad. Seafood gumbo takes a little time to prepare (and a lot of money to buy the ingredients). Gumbo can be made with seafood, chicken and sausage, sausage and seafood, etc.. it’s up to you and your taste. All you need to do is vary the recipe. If you love shrimp but hate oysters, leave them out. Try substituting the oysters with some diced up fish fillets, add some crawfish tails, etc. 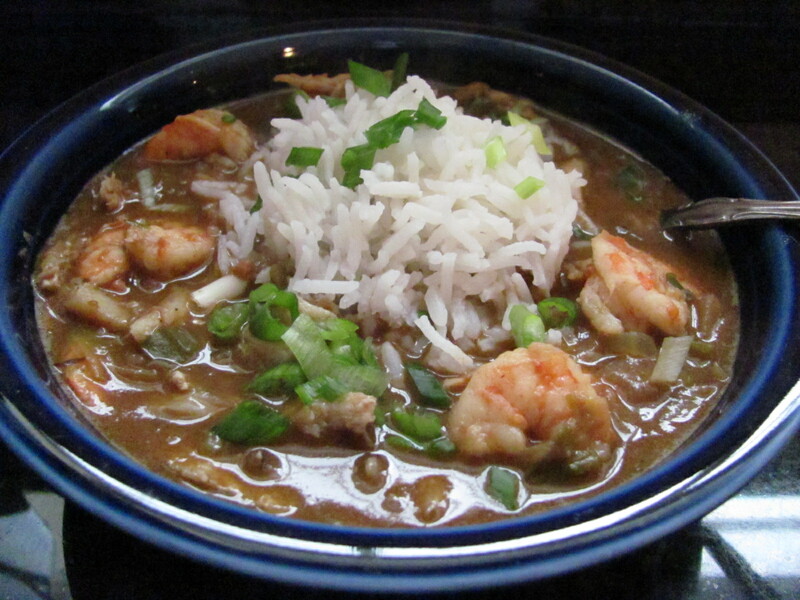 The trick to a flavorful gumbo is the roux. Roux is simply equal parts fat (oil, butter, etc) and flour cooked to varying stages based on color. For a simple biscuit gravy, you make a light roux. For a rich gumbo, you want a DARK roux, which is achieved by cooking down, stirring constantly, until the roux achieves the color you desire. All Cajun cooking starts with a “trinity”. A trinity is a mixture of onions, bell peppers and celery and it is the basis for every recipe from the swamps. In a large, heavy bottomed stock pot, over medium heat, heat the oil until hot. Add the flour, whisking constantly. Continue to cook and the roux will turn from a blonde roux, to sand, to light brown, to caramel color. Once it reaches caramel color, turn down the heat and continue to cook, whisking constantly, until the roux is a dark brown color. The darker the color, the more flavorful the gumbo. Increase the heat back to medium and add the garlic, onions, celery and bell peppers to the roux. Cook, stirring constantly, for 10 minutes. Add the oregano, Old Bay, bay leaves, thyme and cayenne. Mix well, then add the clam juice, water, green onions and parsley. Bring to a gentle boil, reduce heat to low and simmer for 10 minutes. Add the shrimp, crab meat, oysters and their liquor (the juice in the pint with the oysters), then add the salt, pepper and some Tabasco sauce. Reduce the heat to as low as your cooktop will go and simmer, covered, for 1 hour, stirring frequently to prevent the flour from burning. Remove from the heat and serve over cooked white rice. 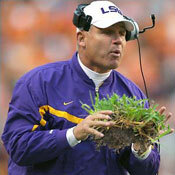 Let Les Miles dine on Bentgrass while you enjoy this delicious dish! This entry was posted in Entree, Soup, Tailgating Recipes and tagged Cajun, crab, creole, gumbo, oysters, roux, shrimp by quarlj01. Bookmark the permalink.